Hi All! I hope you are all staying cool. It has been miserably hot here in Texas. It’s been in the triple digits this week, making it really hard to get motivated to do anything except site in the house where it’s cool. 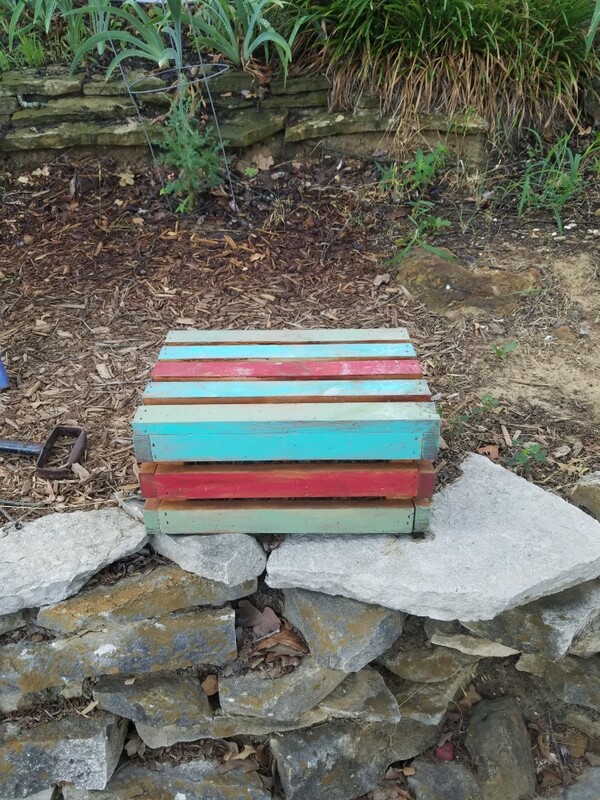 Today I want to share How to Add Color to a Wooden Crate Hubby style. 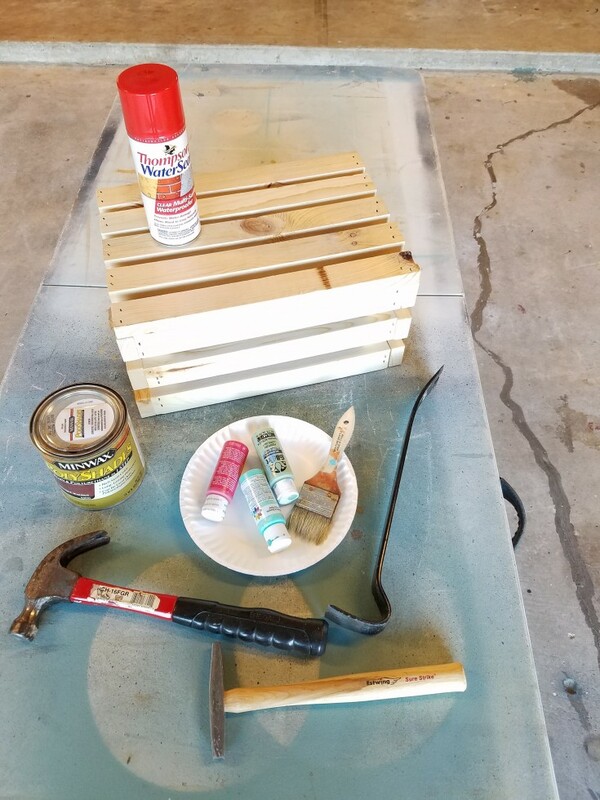 If you remember my post Junkin at Antique Alley, this is the crate the hubby bought to use in raising the vintage bucket up some in the red wagon. Hubby didn’t like it plain so he added some color. 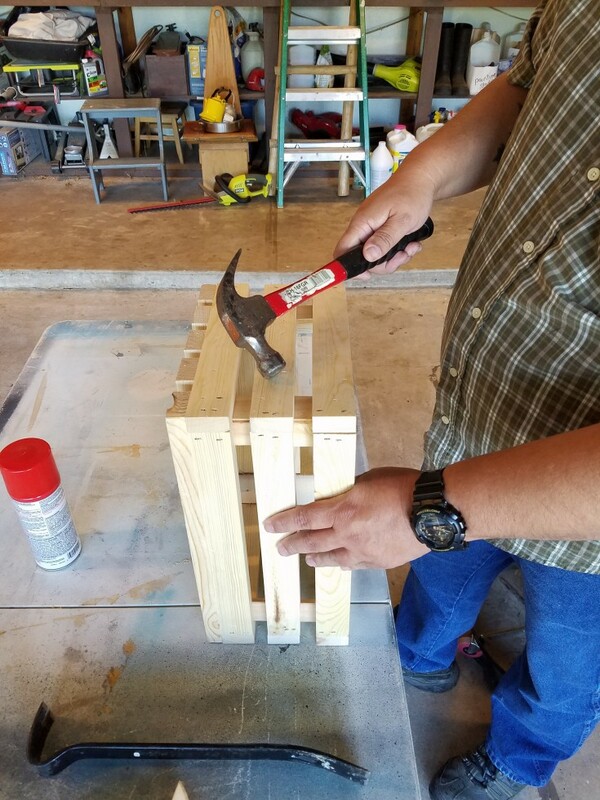 First using a crow bar and hammer he distressed the wood crate. 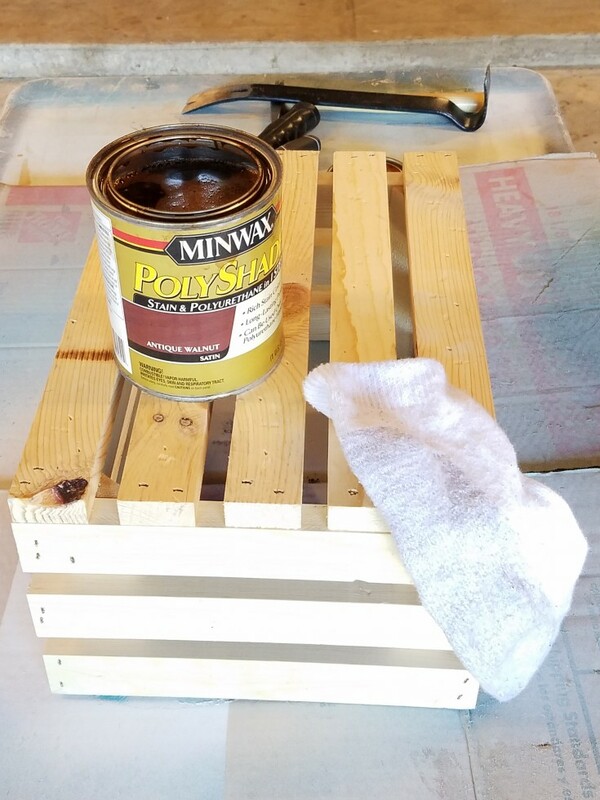 Then he used some Polyshade stain to help age the crate. 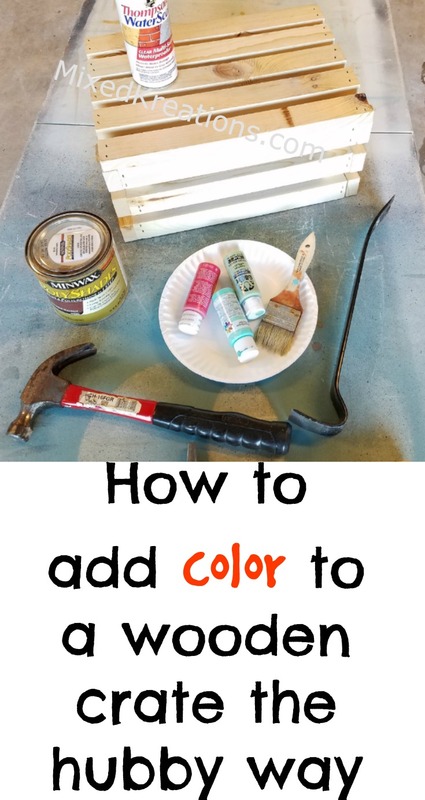 I myself would have added the stain or homemade aging solution after adding the paint colors. 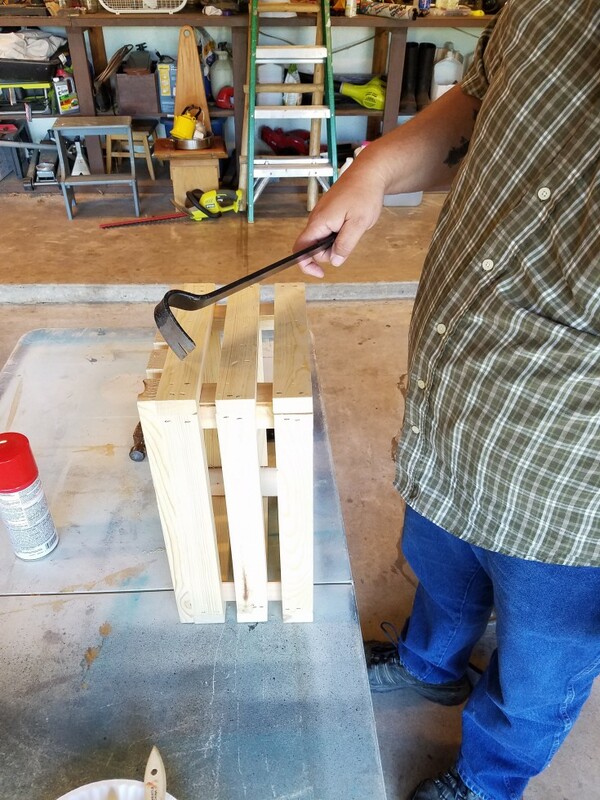 But this is his project so he can do as he pleases. 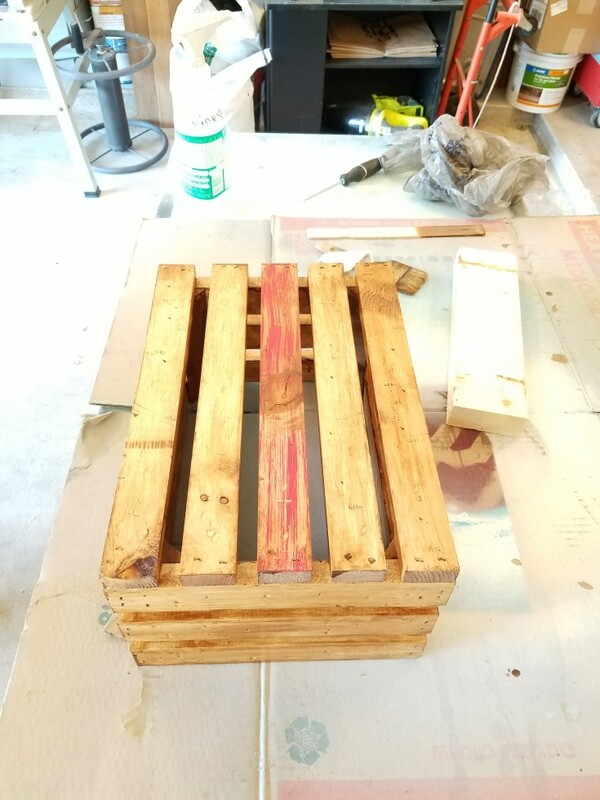 Once he has the crate completely covered with the stain and is dry. 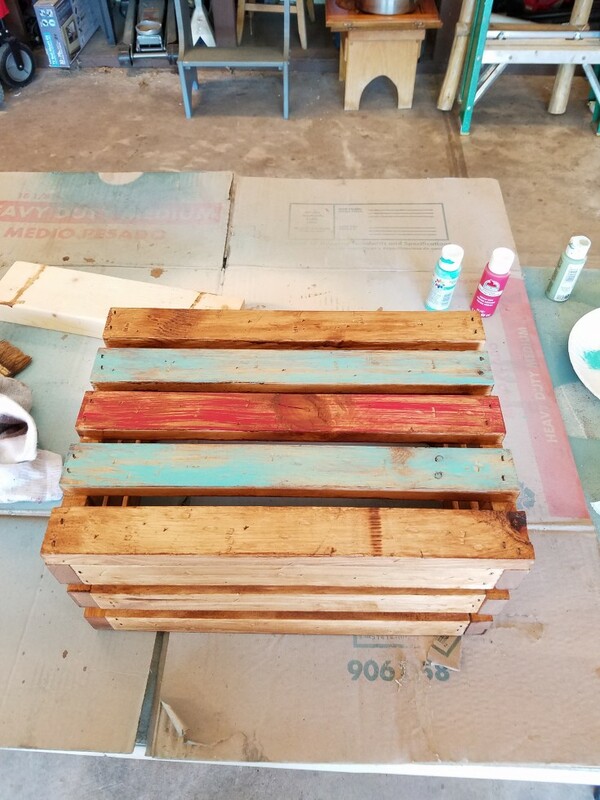 He starts adding the color to the sides and bottom of the crate by dry brushing it on not covering it completely. 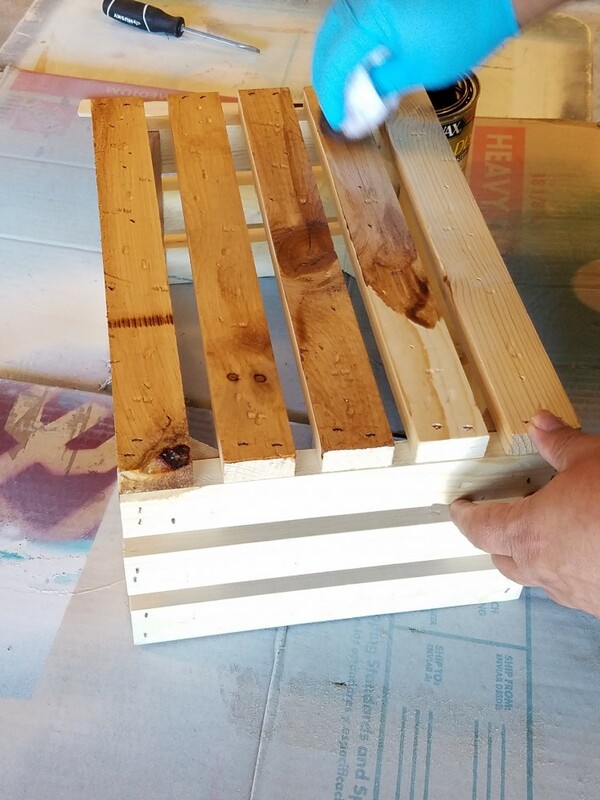 Letting some of the stain show through. 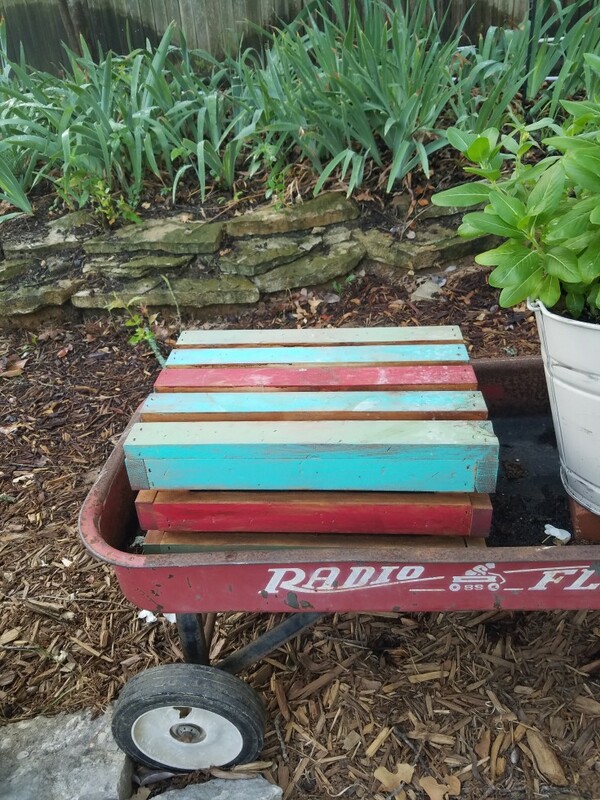 Adding color to a wood crate to be used as a plant stand. 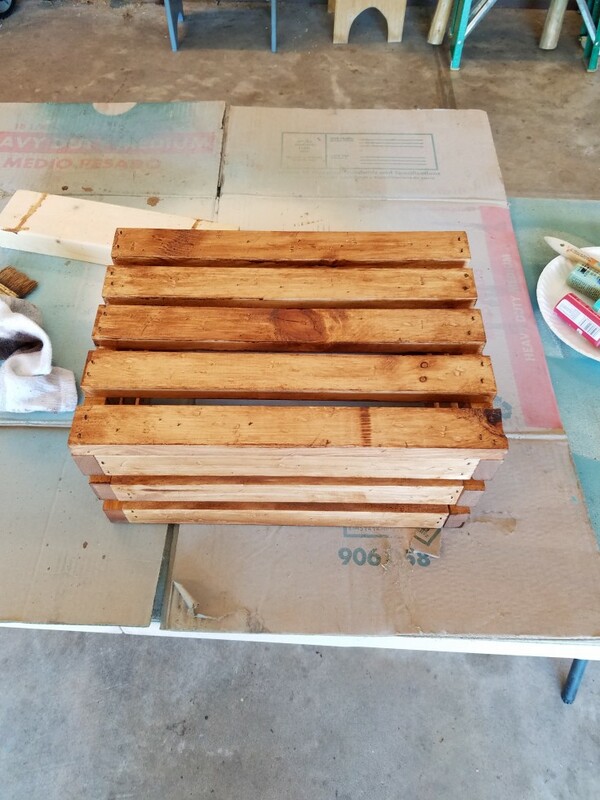 After the wooden crate is dry he sealed it with Thompson Water Sealer. Left to dry for a few hours before putting it in the little wagon. 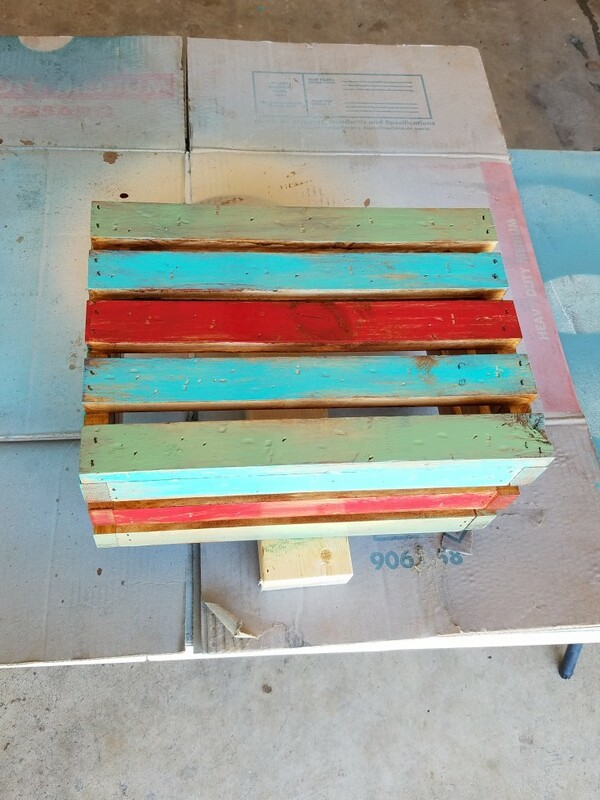 That is how to add color to a wooden crate the hubby way. How did he do? 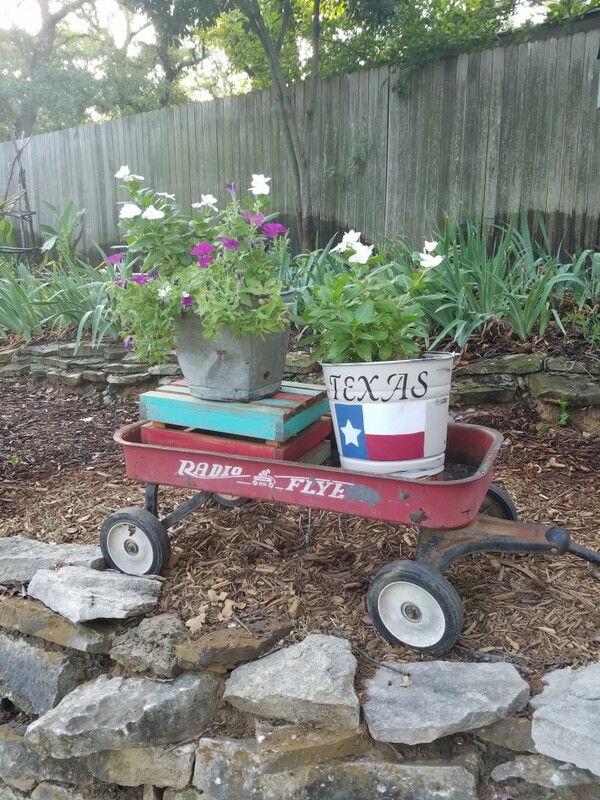 More of the Hubby’s Projects You May Enjoy! Linda I really like how your husband let the stain show through on the wood. It makes for a very interesting effect and all those pretty colors still show. Thank Michelle! It’s pretty cool that he gets out there I has his own projects, the ex never would of done that. I think he did a great job on it!